In an era where every fight online is fought with numbers, this 50-year-old book should be made a compulsory college reading. Stats and graphs are part every news-hour show and part of every political discourse now. But every bit of number is taken as fact instead of being questioned. This is where Darrell Huff’s small and simple book comes into picture. The first eight chapters deal with how simple statistical/graph tricks could be use to cheat common man. 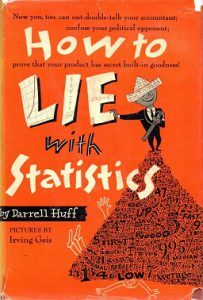 Some of the statistical manipulations it deals in detail are prevalent even today. For example, sample surveys with built-in bias, misuse of different types of averages (mean, median and mode), how one-dimensional picture graphs lie etc. In fact you could find them easily when you watch a politician talk or if you read a newspaper article. This book is sort of warning if you work as a data analyst or visualizer and a guide if you are a reader, specially the last two chapters. The ninth chapter talks about statisticulation. This chapter deals with how sometimes how the data gets twisted, exaggerated, over-simplified, and distorted-through-selection by salesman, public-relations expert, journalist, or advertising copywriter and not exactly by statistician. This is why I think its important who are involved in data analysis top publish raw data and steps/code to reproduce the analysis. The last chapter is geared towards the consumer of stats and graphs. It gives tips to ask questions. He argues that just five simple questions can be used as litmus test. I think these questions are applicable beyond stats. We need to apply them for any kind of news or analysis that we read these days. The book is full of quotable quotes. I have some of my favorite below. BTW you can read the book on Archive.org for free. Not all the statistical information that you may come upon can be tested with the sureness of chemical analysis or of what goes on in an assayer’s laboratory. But you can prod the stuff with five simple questions, and by finding the answers avoid learning a remarkable lot that isn’t so. Misinforming people by the use of statistical material might be called statistical manipulation; in a word (though not a very good one), statisticulation. Watch out for evidence of a biased sample, one that has been selected improperly or – as with this one – has selected itself. Ask the question we dealt with in an early chapter: Is the sample large enough to permit any reliable conclusion? The secret language of statistics, so appealing in a fact-minded culture, is employed to sensationalize, inflate, confuse, and oversimplify. how can download this book? Can you tell me Where do i will get this book..? ?